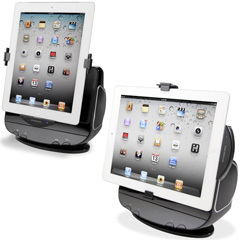 The Powered Rotation iPad Stereo Dock lets you easily rotate your iPad between portrait and landscape viewing orientations via remote control. Portrait. No, landscape. No, portrait. Whichever way you look at it, this gadget called the Powered Rotation iPad Stereo Dock makes switching between news-reading and movie-watching modes as easy as pressing a button. Effortlessly rotating your iPad between portrait and landscape with its motorized rotating arm, this pivoting powerhouse ensures an optimal viewing orientation without having to manhandle your iPad — letting you easily switch between an article on the New York Times and a related video on YouTube with a tap on its included remote control. Including two 5-watt, full-range speakers on either side of the base for rich, clean sound, the Powered Rotation iPad Stereo Dock is available now from Hammacher Schlemmer for $99.95. « Black Friday Weekend: Specials, Freebies And More!